daily backup A backup type that backs up all of the files that have been modified on the day that the daily backup is performed. The archive attribute is not set on the files that have been backed up. data compression The process of storing data in a form that takes less space than the uncompressed data. data encryption The process of translating data into code that is not easily accessible to increase security. Once data has been encrypted, a user must have a password or key to decrypt the data. DCPROMO A utility used to upgrade a server to a domain controller, after the server has been installed with the Windows 2000 Server operating system. The DCPROMO utility also can be used to downgrade a domain controller to a member server. Debugging Mode A Windows 2000 Advanced Option menu item that runs the Kernel Debugger, if that utility is installed. The Kernel Debugger is an advanced troubleshooting utility. default gateway A TCP/IP configuration option that specifies the gateway that will be used if the network contains routers. demand-dial routing connections Support for both inbound connections and outbound connections for an RAS server. Desktop A directory that the background of the Windows Explorer shell represents. By default, the Desktop includes objects that contain the local storage devices and available network shares. Also a key operating part of the Windows 2000 graphical interface. device driver Software that allows a specific piece of hardware to communicate with the Windows 2000 operating system. Device Manager A Windows 2000 utility used to provide information about the computer's configuration. Dfs See Distributed file system. Dfs link A component of the Distributed file system (Dfs) topology. A Dfs link points from the Dfs root to one or more Dfs shared folders. Dfs replication The replication of one or more Dfs shared folders. Dfs replication ensures that if the host server goes down, the files and folders that are part of the Dfs will be available. Dfs root A component of the Distributed file system (Dfs) topology. The Dfs root contains the Dfs shared folders and Dfs links. You can create a domain-based Dfs root or a stand-alone Dfs root. Dfs shared folder A component of the Distributed file system (Dfs) topology. Dfs links point to Dfs shared folders. DHCP See Dynamic Host Configuration Protocol. DHCP server A server configured to provide DHCP clients with all of their IP configuration information automatically. dial-up networking A service that allows remote users to dial into the network or the Internet (such as through a telephone or an ISDN connection). Dialup group A Windows 2000 special group that includes users who log on to the network from a dial-up connection. differential backup A backup type that copies only the files that have been changed since the last normal backup (full backup) or incremental backup. A differential backup backs up only those files that have changed since the last full backup, but does not reset the archive bit. Digital Versatile Disc (DVD) A disk standard that supports up to 4.7GB of data. One of DVD's strongest features is backward compatibility with CD-ROM technology, so that a DVD drive can play CD-ROMs. Formerly known as Digital Video Disk. directory replication The process of copying a directory structure from an export computer to an import computer(s). Any time changes are made to the export computer, the import com-puter(s) is automatically updated with the changes. Directory Services Restore Mode A Windows 2000 Advanced Option menu item that is used by Windows 2000 Server computers that are configured as domain controllers to restore the Active Directory. This option is not available on Windows 2000 Server computers that are installed as member servers. Disk Cleanup A Windows 2000 utility used to identify areas of disk space that can be deleted to free additional hard disk space. Disk Cleanup works by identifying temporary files, Internet cache files, and unnecessary program files. disk defragmentation The process of rearranging the existing files on a disk so that they are stored contiguously, which optimizes access to those files. Disk Defragmenter A Windows 2000 utility that performs disk defragmentation. disk image An exact duplicate of a hard disk, used for automated installation. The disk image is copied from a reference computer that is configured in the same manner as the computers on which Windows 2000 will be installed. Disk Management A Windows 2000 graphical tool for managing disks and volumes. disk partitioning The process of creating logical partitions on the physical hard drive. disk quota policies These policies are used to specify how much disk space can be allocated by users. disk quotas A Windows 2000 feature used to specify how much disk space a user is allowed to use on specific NTFS volumes. Disk quotas can be applied for all users or for specific users. distribution group A type of group that can be created on a Windows 2000 domain controller in the Active Directory. A distribution group is a logical group of users who have common characteristics. Distribution groups can be used by applications and e-mail programs. Distributed file system (Dfs) A Windows 2000's Server feature that uses a central database of links that point to shares across the network. Dfs provides users with a central location to access files and folders that are physically distributed across a network. Files that are stored on several computers in a domain appear to the user to all reside in the same network share. 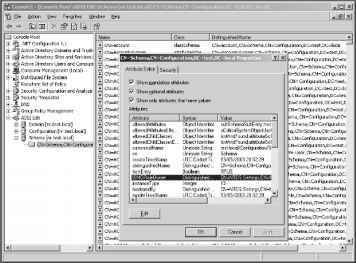 Distributed File System utility The Windows 2000 Server utility used to configure and manage the Distributed file system (Dfs). distribution server A network server that contains the Windows 2000 distribution files that have been copied from the distribution CD. Clients can connect to the distribution server and install Windows 2000 over the network. DNS See Domain Name System. DNS client policies These policies are used to configure DNS properties for Windows 2000 clients. DNS server A server that uses DNS to resolve domain or host names to IP addresses. domain In Microsoft networks, an arrangement of client and server computers referenced by a specific name that shares a single security permissions database. On the Internet, a domain is a named collection of hosts and subdomains, registered with a unique name by the InterNIC. domain-based Dfs root In the Distributed file system (Dfs), a type of Dfs root that automatically publishes its Dfs topology to the Active Directory. A domain-based Dfs root has Dfs replication capabilities for fault tolerance. domain controller A Windows 2000 Server computer that stores the complete domain database. Domain Controllers Policy A Microsoft Management Console (MMC) snap-in used to implement domain account policies. domain forest A set of domain trees that does not form a contiguous namespace. For example, you might have a forest if your company merged with another company. With a forest, you could each maintain a separate corporate identity through your namespace, but share information across the Active Directory. domain local group A scope for a group on a Windows 2000 domain controller. A domain local group is used to assign permissions to resources. Local groups can contain user accounts, universal groups, and global groups from any domain in the domain tree or domain forest. A domain local group can also contain other domain local groups from its own local domain. domain name A name that identifies one or more IP addresses, such as sybex.com. Domain names are used in URLs to identify particular Web pages. domain name server An Internet host dedicated to the function of translating fully qualified domain names (host names) into IP addresses. Domain Name System (DNS) The TCP/IP network service that translates fully qualified domain names (host names) into IP addresses. domain policies Policies applied at the domain level that allow administrators to control what a user can do after logging on. Domain policies include audit policies, security option policies, and user rights policies. These policies are set through Domain Controllers Policy. domain security Security that governs a user's ability to access domain resources. Any domain policies you define override the local policies of a computer. domain tree A hierarchical organization of domains in a single, contiguous namespace. In the Active Directory, a tree is a hierarchy of domains that are connected to each other through a series of trust relationships (logical links that combine two or more domains into a single administrative unit). domain user account A user account that is stored in the Windows 2000 Server Active Directory's central database. A domain user account can provide a user with a single user account for a network. Also called an Active Directory user account. drive letter A single letter assigned as an abbreviation to a mass-storage volume available to a computer. driver A program that provides a software interface to a hardware device. Drivers are written for the specific devices they control, but they present a common software interface to the computer's operating system, allowing all devices of a similar type to be controlled as if they were the same. driver signing A digital imprint that is Microsoft's way of guaranteeing that a driver has been tested and will work with the computer. dual-booting The process of allowing a computer to boot more than one operating system. dynamic disk A Windows 2000 disk-storage technique. A dynamic disk is divided into dynamic volumes. Dynamic volumes cannot contain partitions or logical drives. You can size or resize a dynamic disk without restarting Windows 2000. Dynamic disks are accessible only to Windows 2000 systems. Dynamic Host Configuration Protocol (DHCP) A method of automatically assigning IP addresses to client computers on a network. dynamic storage A Windows 2000 disk-storage system that is configured as volumes. Windows 2000 Server dynamic storage supports simple volumes, spanned volumes, striped volumes, mirrored volumes, and RAID-5 volumes.